Nothing ages a face more than the eyes. If you are weary of looking tired and appear much older than you are, you can rejuvenate your appearance with blepharoplasty, also called an eyelid lift or eyelid surgery. The blepharoplasty procedure will make your eyes look younger by smoothing and firming up the eyelid skin, reducing the hooded appearance and removing bags under your eyes. 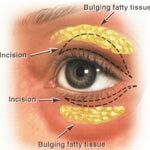 Blepharoplasty or eye lid surgery is one of the most effective and popular cosmetic procedures in the US. It involves surgery on either the upper or lower eyelids. In the case of the upper eyelids, this includes repairing droopy eyelids by removing excess skin, muscle and fat, or removing wrinkles. If it is carried out on the lower lids, then it is usually performed to reduce the puffiness or ‘eye bags’ that are commonly seen under the eyes. You need to have realistic expectations regarding the outcome of this type of surgery. This procedure will reduce your tired appearance and improve your confidence and self-esteem. As long as you are clear about why you want this type of surgery and have discussed your reasons thoroughly with your surgeon then you should be suitable for this type of procedure. The vast majority of patients who have blepharoplasty performed are happy with their new and improved appearance and state that they feel more confident, enjoy a greater sense of well being and overall, an improved quality of life. Ask your doctor about BOTOX® Cosmetic to find out if it is right for you. You can learn more about what BOTOX® Cosmetic is, read about safety and browse through some of our frequently asked questions by clicking here. Also, you can learn about why skin ages and find out about BOTOX® Cosmetic for Men. Sage Eyecare will discuss your goals and answer any questions you may have as well as benefits and risks of the procedure you may be considering.